"This Wide Field and Planetary Camera 2 image captures the infancy of the Stingray nebula (Hen-1357), the youngest known planetary nebula. 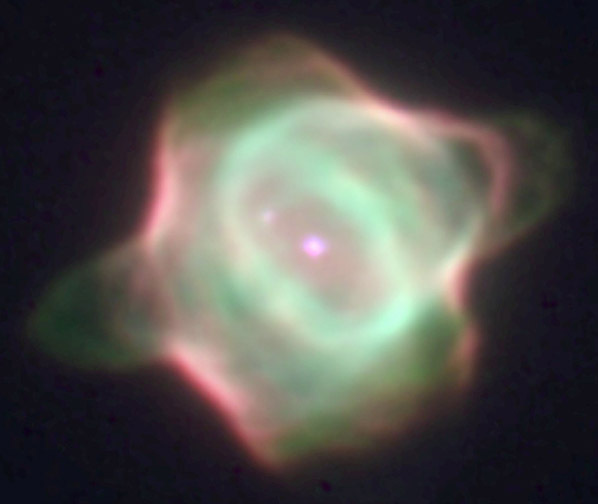 In this image, the bright central star is in the middle of the green ring of gas. Its companion star is diagonally above it at 10 o'clock. A spur of gas (green) is forming a faint bridge to the companion star due to gravitational attraction. The image also shows a ring of gas (green) surrounding the central star, with bubbles of gas to the lower left and upper right of the ring. The wind of material propelled by radiation from the hot central star has created enough pressure to blow open holes in the ends of the bubbles, allowing gas to escape. The red curved lines represent bright gas that is heated by a "shock" caused when the central star's wind hits the walls of the bubbles. The nebula is as large as 130 solar systems, but, at its distance of 18,000 light-years, it appears only as big as a dime viewed a mile away. The Stingray is located in the direction of the southern constellation Ara (the Altar). The colors shown are actual colors emitted by nitrogen (red), oxygen (green), and hydrogen (blue). " (NASA description). Photo credit: NASA, Matt Bobrowsky, Orbital Sciences Corporation.